The moment I first saw a chocolate rose, I was consumed with the need to make one as soon as possible. I was originally going to give myself a little break after my nephew’s party, but I just couldn’t help myself – next morning, I sleepily rolled out of bed, had leftover cake for breakfast (like a real adult) and got started! Pure chocolate is much more difficult to sculpt, so you will need to use something called modeling chocolate instead. Modeling chocolate, made by mixing chocolate and syrup, is very similar to clay, and is therefore ideal for crafting shapes with – particularly delicate shapes like the rose. You can buy your own modeling chocolate, or you can make it! Just melt 16 oz dark chocolate and mix in ½ cup syrup (take your pick – I used cane sugar syrup, but other kinds will put a fun twist on the flavor). Wrap the mixture in plastic and let it cool for about an hour before handling it. Once it has cooled, it’s ready to be molded into whatever shape you want! Modeling chocolate hardens when dry, but it will become claylike again when warmed. You can use it again and again! Tip: When working with modeling chocolate, cover your hands and working space with cocoa powder to prevent excess stickiness. 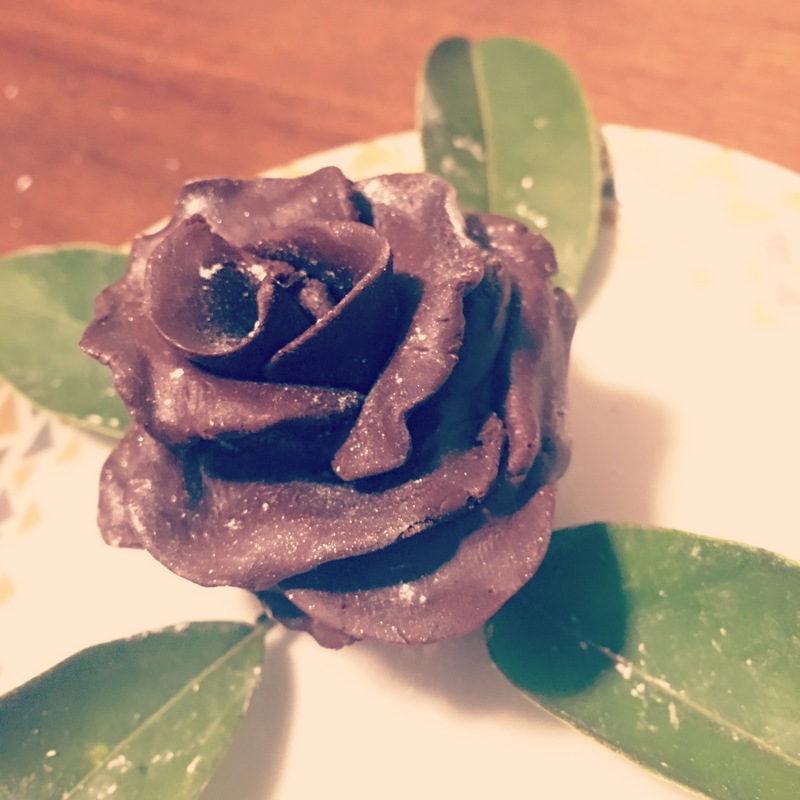 There are many tutorials online for making chocolate roses. I loosely followed the steps outlined in these videos, cutting and shaping and poking until it got to a place I was happy with. The videos are a guideline – embrace your creativity and make something that looks perfect to you! Once you’ve finished sculpting your rose, it’s time to get the presentation just right. Painting luster dust onto the petals will give the rose a nice color, but since I didn’t have my luster dust at the time, I sprinkled cocoa powder instead, and that seemed to work decently as well. Another fun trick is to mix rose essential oil into your modeling chocolate so your creation will even smell like a rose! My personal finishing touch was some real flowers from the garden – I bundled them together with the chocolate rose to make a mini bouquet and stuck them together in a cute little vase. As you can see below, the combination really brings the chocolate rose to life!